Craig Silkens, a sports massage therapist and personal trainer at M Club, explains the benefits of power training. All too often I am inundated with the same question that is; “what’s the best exercise for…. ?” With clients making reference to weight loss, increasing muscle mass and/or muscle tone, for general fitness, the list goes on. My answer for the last 15 years has remained the same; there is no one magic exercise that cures all your health issues and takes you directly to your health & fitness destination. Whatever you want your results to be at the end of your fitness journey you have to understand that it is in fact a journey, and a journey takes time and a degree of commitment. The exercises you choose to perform to take you there will play a large part in determining the end result, for example if you choose to purely do cardio then you could end up very lean and slim, if you chose to do just weight training you could end up looking very muscular and bulky. My advice has always been to find a balance and do both in whatever ratio suits you, your lifestyle and of course your end goal. And this is exactly how I train and encourage my clients to train, but I do also like to throw a spanner in the works every once in a while just to shock the body and keep it on its toes. Power training is my personal favourite way to get a fantastic calorie burn, train the heart and lungs to a high percentage and condition the muscles all at the same time. Power training in essence is about moving a resistance as quickly and forcibly as possible, whether that resistance be your own body weight (such as in my examples) or a physical weight. However, the action must still be performed under control to avoid injury and for this reason body weight exercises are a normal preference as it is difficult to control free weights properly when moving them rapidly. -complete 10-sets of 5-repetitions on each exercise before moving onto the next, this will take some time because there are many recovery periods between the sets and the exercises but you will be able to offer 100% commitment to each set of each exercise forcing a greater muscular response. Recovery between sets should be no longer than 30 seconds. -complete 1-set of 5-repetitions before moving onto the next exercise and repeat the sequence of exercises in a circuit style training fashion, this style will get you through your workout far quicker due to less recovery periods but by the seventh set on wards you’ll no longer be able to commit 100% to the exercises due to fatigue, you will however achieve a greater cardio response. There is no recovery between sets, only a 30 seconds breather after each completed circuit of the 4 exercises. 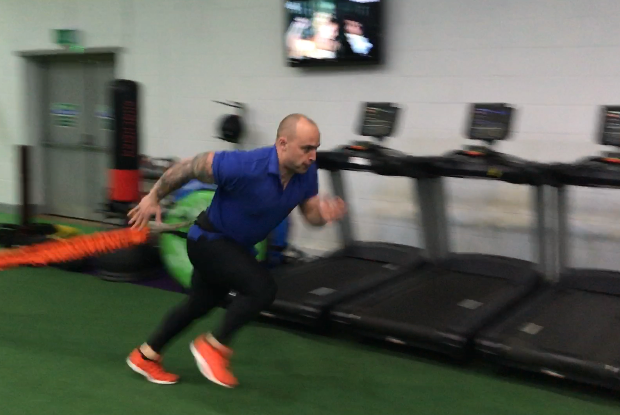 Bungee Runs – an old school drill designed to improve explosive sprint performance. This exercise is largely adopted by sports people but I often get my clients to do these drills as they simply get the heart rate pounding and calorie count flying. 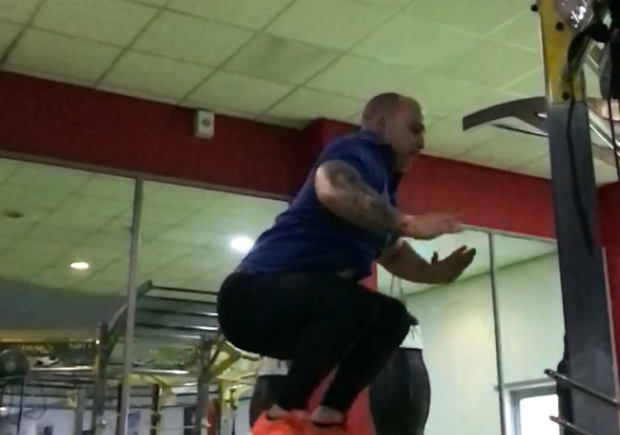 Box jumps (variation-tuck jumps) – this exercise does require a little mental steel because a lot of people will be very nervous of clipping the box and hurting themselves, so it is important to start on the lowest setting and progress from there at a rate that is comfortable. 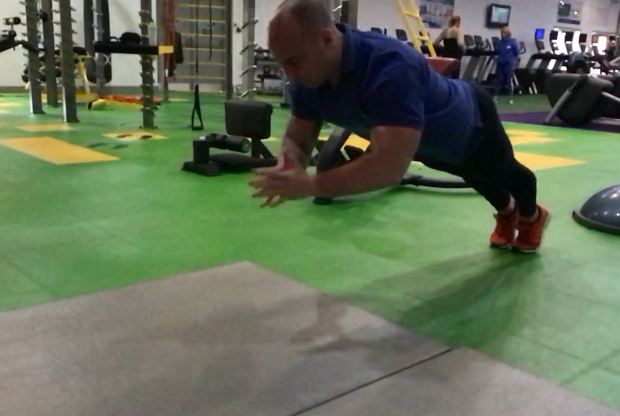 Clap push ups – an explosive exercise for the upper body and core. If you find conventional push ups easy then try these, they’ll get your heart rate going twice as fast. If needs be go onto the knees to perfect the form and help with any fear of crashing into the floor. 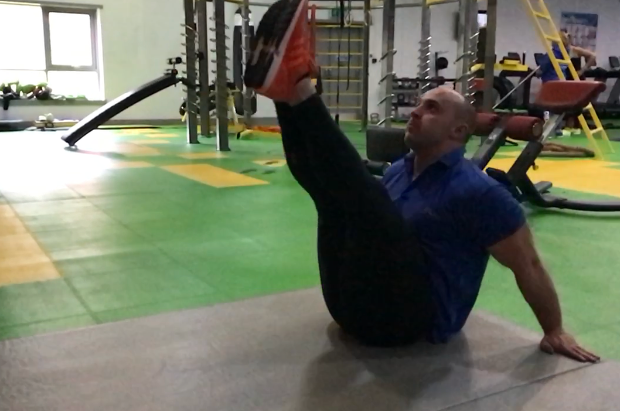 Straight leg ‘V’ Crunches – generally I like to train the abs in a slow controlled fashion, but every now and then I will expose them to some rapid actions such as these. These will help develop explosive power through the trunk, incredibly beneficial if you are a sports person.